I'm a December Daily mini kit designer! I am so happy to finally be able to share the news that I am one of the mini kit designers for Ali Edwards December Daily® 2016! I love December Daily®, it's one of my favorite projects I do each year, so when I was invited to design a mini kit I didn't hesitate to say yes. I knew instantly that I wanted my kit to feel fresh and festive, be fun and playful, and yet, also wanted it to mix with the more traditional kits, so it'd have to have neutral elements. I also wanted it to be warm weather winter appropriate too, for all of us that have Decembers that aren't exactly full of snow days. I love a good creative design challenge! I'm super excited with the way it turned out and I can't wait to reveal the entire kit to you here on September 1! These are just some sneak peeks so you can get the feel for the kit. If you aren't familiar with December Daily®, it's a month of December memory keeping in an album concept created by Ali Edwards. I think this will be my 5th year participating. Some albums of mine aren't quite finished yet, but most are, and I love bringing them out and looking through them each Holiday Season. Seeing Ali's is what got me started in scrapbooking/memory keeping at all, and I feel forever grateful that she thought up the concept and each year shares it in such a way that it inspires participation. It's so fun and not nearly the "added to-do in one of the busiest times of the year" that it might sound like if you've never tried it. It actually helps me be more mindful, to slow down and notice the important things. Head over to her site to see hers through the years and learn more. As I mentioned, I wanted it to work with the other mini kits, and of course, Ali's main kit too, so that people could mix and match as it strikes their fancy. I like it when people use the same products in different combinations to come up with totally personalized and unique feeling results. I feel that is one of the aspects of a successfully designed line. I hope that some of the pieces will be so fun to use that it will inspire participation and easily spread some joy and merriment around. I love fun products that make me want to use them, that's my hope with these. Some "let's get using this!" sparks to get you telling your stories and wanting to engage creatively. Of course, me being me, it was hard to limit my ideas. I immediately had 10,000 and I wanted to include them all, lol. I was grateful for the awesome team I worked with who excelled at editing where I did not. The paper was one very fun part of designing, getting to choose and design the other kit components and embellishments was another. More on all that when my full kit is revealed September 1, when presale opens up for December Daily® 2016. If you want to be on the December Daily® specific email newsletter list, you can sign up at the bottom of this page here. A few items did sell out pretty quickly last year. Those on the newsletter know the news first. It feels great to have my name on a product I fully believe in and love. I was stalking my mailbox once I knew it was on it's way to me and it didn't disappoint! So excited to share more with you soon, in the meantime, they are doing a fun reveal all week of all the other mini kit designers and sneaks of their kits on decemberdaily.com I don't even know who the other designers are or what their kits look like, so I'm as excited to get that daily email and check the site for more info myself! Order selection period start September 1, which I know might sound early, but with shipping and prep to consider, it ends up being perfect timing. Plus, December will be here before we know it (yikes!) Hope some of you that are new to December Daily® will join me this year, and hope those that are regular participants will enjoy my kit!! I can not wait to see it's pieces in use. I'll share more of my design process after the reveal of the entire kit, because I for one love the behind the scenes scoop too. Wow. Like so many others, I find myself saying, "how is that possible?". I remember a theory someone told me once; that because each year is a smaller fraction of our life, it seems to go faster...(or something like that. Anyone know what I'm talking about?) Anyway, it sure feels like it's accurate to me. I'm getting too old because the years are going by too quickly. Being wowed by the sky - and loving the rain (even though we really need a new roof). I also like that December Daily gives me a determination to keep creating, even though there are so many other things to do. At a time when so many other to-dos are fighting for a space on the list, crafting just because I want to seems a little indulgent, but crafting because I'm documenting our December seems less guilt inducing for me. Dugie is always so happy to have Ali home. (Sharing the parental focus certainly doesn't hurt). We had lots of fun Saturday night playing games. This one was a new favorite. And this one is going to be in a stocking here this year. I'm excited, we love games. A realtor had dropped off a box of chocolates thank you gift at the door and the kids were only too happy to dig in. They both love it. My husband is a very healthy eater, so he never wants any, and I don't like chocolate, so it's all theirs. They get so excited about it, it makes me wish I did like it. Games and chocolate, a good Saturday night. Before studying for finals put an end to the fun. I know I'm biased, but seriously, how cute is he in his glasses?!? Holiday baking is always a tradition. These are sugar cookies with food coloring. Yum. I might have just eaten a few for breakfast actually...don't tell the healthy husband! Here, yesterday. Lights being put on the tree, studying for this week's finals, reading for fun, the puzzle picked and waiting for the table to be cleared, furniture and things moved out of the way for the tree and not given a new place yet, a tree skirt patiently waiting to serve it's purpose, and lots of other messes of everyday life. Looking at this photo, I wish I would have straightened up first, but it's what is really going on. As soon as I'm done with this post I am going to straighten the pillows, fold the blankets, straighten the books at least. Unless I forget and move on to something else of course. One more sky shot taken last week. It's really been taking my breath away lately. And now you're pretty much caught up on what's been going on around here. Even though it's the holiday season, it's still pretty quiet and calm and the hustle and bustle of the holidays hasn't set in. I'm still not feeling in the spirit. I guess I'd need to go out into the world for reasons other than to chauffeur, but I just don't want to. I might just get away with it too...I'll keep you posted. Happy December 15 to you! One of my favorite things about an album like this or a travel journal is the layers that you can see waiting for discovery. The first of December is my sweet Ali's birthday. She was at school, so I had her send me photos of the celebrating she did with friends, since we had celebrated with her before it was December. I sewed the cut out photo onto my tester paper from stamp carving. It was definitely inspired by seeing Tina Azmus's page of her son, seen here. I'm getting downright adventuresome with my digital explorations, buying printables from both One Little Bird and Paislee Press and putting them right to use. The birthday stuff is from One Little Bird. That's a transparency sheet on the right with Be Very Merry and the cute deer from the kit on top. It was because I saw Maria's darling Merry Every Thing seen here. Had I known that my white pen was going to behaving badly, I would have digitally added that too! Oh well, not important enough to reprint, it'll be all the same at the end. Serious fun for almost no cost. You could even make these stars with an Xacto knife and some white erasers if you wanted to. It makes me very happy. The only thing I'd change if I hadn't cleaned up already is that I'd stamp on top of the silver round parts from the outside label. But I'm over it, so it'll stay this way. My favorite star was the one that I added extra little carves in. You can see what I mean in the blue one above. I was thinking about adding a few gold stars but I am liking the white space, so I probably won't. I originally made 3 stars, large, medium and small, then broke the medium by cleaning it too roughly so turned it into a second small star. I'm not sure if it's that I'm rough, or that stamps made out of erasers aren't quite as sturdy as other carving materials. Or maybe hand carved stamps just don't last forever regardless. 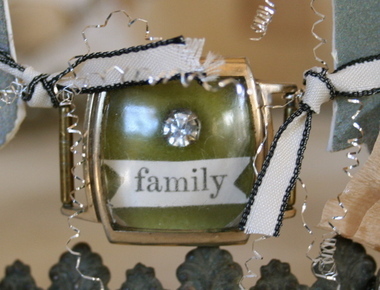 They worked great for this and I am already thinking of other stamps I want to carve. it's how it always goes, if it's fun, I want to make more. Might get to make some tomorrow...the weekend isn't over yet! I was seriously wowed when I opened the box. There is so much to love. I love the unique colors in the kit, especially the golden striped binder. I like to leave my binder covers plain, for stacking on shelves, and sliding in and out bookcases without knocking off any embellishments. This cover, with it's gold stripes and pretty sage green binding make it decorated without requiring anything extra in my mind. The pink and red combination on some papers, and less traditional mixes are a favorite too, as well as the products designed by designers exclusive to the Gossamer Blue kit. These colors....the minty turquoise, warm red, gold and white...I'm not usually a huge fan of red, but I'm really liking this combo this Christmas. So very many fun embellishments in this kit. I love it when kits have exclusive items, and this kit is choc full of them! And so many fun papers, with duplicates so you can try out different ideas and use different ways. I love the new designer collections, Gramercy Road, On my Desk, and Get Happy over at Gossamer Blue too, and added a few items from each. I also added rub on stars from Studio Calico, and letterpress cards from Jamaica Makes. With the kit unpacked and all extras gathered, I was good to go. Let the fun begin! This will be the third year I've documented December. For those books I just put the book together as the days went by, without any planning or page prep ahead. That works out for me because I use the photo captured on the day as my jumping off point for choosing colors, papers, and embellishments. This year I decided to follow a few ideas I had from seeing the kit items, but make them non specific so I could still remain flexible as to where they will fit in over the month. Added one of the stars from the kit...and mabye a number for the day of the month will be added. I like to have each day numbered somewhere on the page. I printed out the design I made for the blog hop (seen at the top of the blog post) and decided to use it as a title page. I like it better, a stronger statement. Just a fun little date number tag for the first day in the book. On another page one of the 4x6 papers with a paper banner on top. I'll wait to see what happens on the day I want to use it to decide what to write on the banner. I like to add some embellishments on top of the page protectors on occasion. I have also kept a to do list in past books. I thought this striped paper was perfect for that use in this year's. A few more fitting embellishments on it seemed to make it more fun than the average to do list. I plan to sew these JOY flags onto the page on top of a photo when I get one that matches the colors. The last page I prepped was one I think will be placed toward the end of the month. I used a piece of printed transparency (Allison Kreft) that I had left over from last year, punched holes in it and put it directly in the binder. We're actually going to Paris in December (!!!) and I think the silver Joy to the World is a great embellishment for a photo of us from the trip. 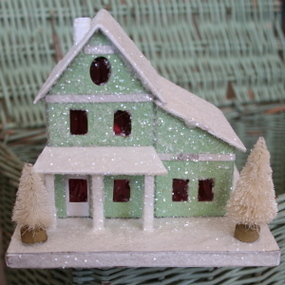 The acrylic snowflake is so sweet as a finishing touch. This Santa is having fun crafting. Happy to have been given the excuse to play with felt and sequins, beads and old finds by my son requesting "more sparkles" on his stocking. Here's the story of our family stockings, as I wrote it on Halloween over at the Silver Bella blog. You can see the stocking that we have used for my son for years. How cute is he that he wants more sparkle? Of course he does! Who wouldn't? So, at the last minute, I'm making him a stocking. I'm using felt that I've had (some of the best stuff was bought years ago in Martha's Stocking Kit). 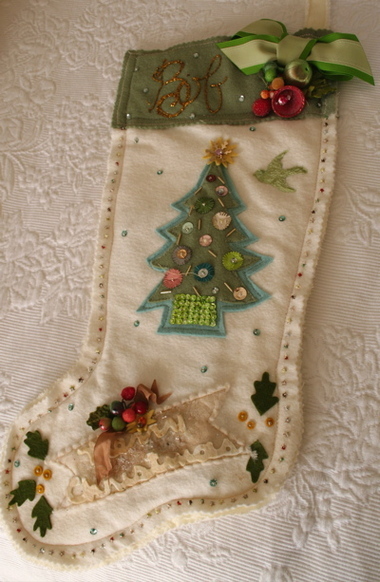 I'm also using bits and pieces I've salvaged from other stockings I've found at thrift stores and flea markets. Here it is in the beginning. You know I'll post pics when it's done. Until then, here's one I made for my husband 2 years ago. Obviously, I've got to get busy on my son's stocking! More when finished. Hope you are making merry memories today. 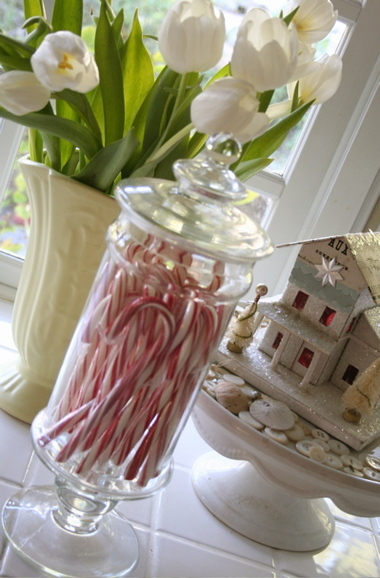 Still loving the candy jar and it's ability to transport me into a holiday mood depending on what's in it. 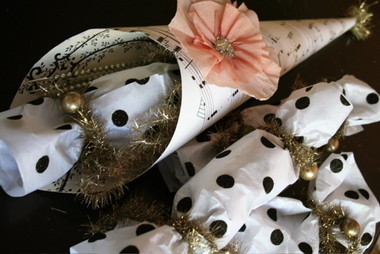 Have you seen this black glitter polka-dot paper made by Papayrus? It's tissue paper, but the glitter stays on really well even though the paper is so bendable. Love it. I can't believe my first ever blog post was a photo of our cards last year. Last year's were far more creative, this year I'm happy to be getting some out at all...Next year I will start earlier, with everything, and I'll get to enjoy all this fun stuff longer. I will. Really, I will!! I owe you a nice big post, but in the meantime, I'll share some bits of Holiday cheer that I happened to photograph yesterday. How we typically decorate for Christmas is to do a few spots over the top. We buy a tree (which you can see the star on the top of it hiding where it's wired to the ceiling) and hang this winter dreams banner from the ceiling near it. I'll show you more of our tree when we finish it. 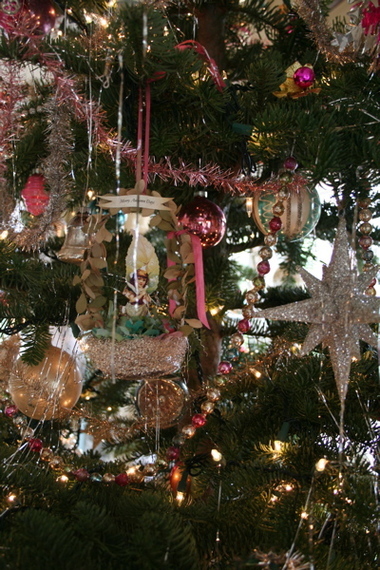 Here's a few ornaments from the tree starting with a Wendy Addison heart. I just bought this bird ornament at my visit to Paris to the Moon. I wish I remembered the name of the artist, but it's not written on the back. It's not mass produced. 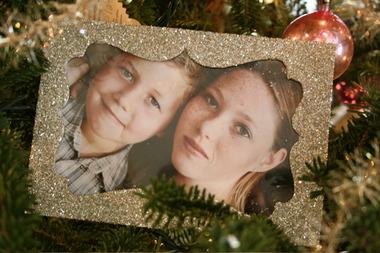 I also bought this frame there, which I think is Wendy Addison's line for Midwest Importers, which nestles a Tara photo of my not so wee-ones. And here's the front door. The wreath from last year lost it's Two Turtle Dove Swag and gained another wreath to the back, so that's a bottle-brush wreath on top of a wire star wreath on top of a silver tinsel wreath. There's some fresh garland on the door frame, with some glittery branches tucked in the middle. See what I mean about a few spots over the top? Plain and simple mixed with glittery abundance. With two big deadlines done, I moved on to a much more fun task today...crafting! I owe Holly for hooking me up with some supplies for Silver Bella, but she wanted to be paid only in hand crafted items, so I've been trying to put a big box of unique goodies together. Inspired by the wonderful SisBoom creations, I made one of Jennifer's ornament wreaths with a slightly different take on it. Of course, when I decided that I had enough vintage ornaments to make this, I didn't have a wreath...so, I took a frame I had from a different wreath, and added some wire for structure. 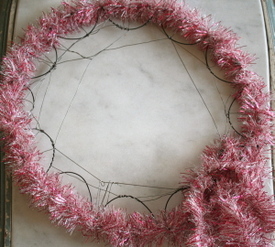 I wrapped pink tinsel around the outside frame as you see here, then I repeated the process with silver tinsel, tucking it in and out of my crazy wire job. The last part was the most fun, wiring and gluing old ornaments, birds and do-dads on. Fun fun. Amazing what some vintage goodies and a new roof line will do for a house. Looks like someone else has been busy crafting today too. How about you? Thanks for all the tree skirt lovin'. You guys are so sweet. I am finally coming up for air from that secret project with the December deadline. That's a sneak peak up above. And now that I'm out from under the panic, I've started to think about decorating for the holidays. Yeah! The boxes came down, and we even dug into a few Sunday night while listening to Christmas music. At one point we had on Barbara Streisand's "Jingle Bells?" which is a really fast, slightly different version of the standard. I loved it when I was a child and it seems to have that appeal, because my son feel under it's spell this year. We ended up having sing-offs, girls against boys, to see who could get the words out correctly and with the music. We girls won every time! We could even annunciate, the boys ended up slurring words and losing tempo, they never even made it all the way through the song without laughing. I highly recommend it as far as cheap entertainment goes. ...Anyway, when I opened the boxes I remembered that last year, after being inspired by an article in Mary Englebreit's Home Companion (I think it was about Margo Tantau?? 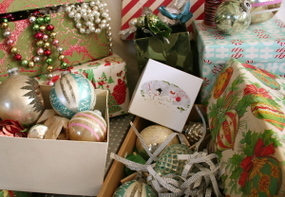 ), I covered a couple of ornament boxes in Christmas giftwrap instead of leaving them plain. Every year a friend sends us fruit from Harry and David and I find those boxes to be perfect for ornaments, they wrap that fruit so carefully. But that box is ugly, so wrap it I did with paper used on Christmas morning. Having forgotten about it, it was a pleasant surprise. I've seen old Christmas boxes on ebay, but never bought any, they were expensive. Maybe I'll wrap a few each year with the paper used that year, I don't know. So anyway, on to the "more skirt love" part of the post title. Like I said yesterday, I love skirts, especially the kind you wear. At artfest one year my friend Amy took a class by Rice Freeman-Zachery on turning jeans into a skirt and then altering the skirt. Amy had the brilliant idea to make a Christmas Holiday skirt. I wasn't in that class, but once I saw Amy's skirt, I had to copy her idea. 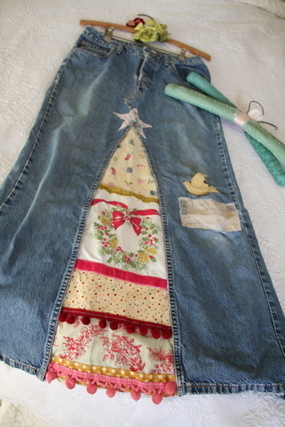 Here is the skirt I made for myself out of an old pair of jeans that I had already patched once (the rectangle patch). I used new and vintage material and of course added some pom-pom fringe as well as other trims. The little velvet bird was a gift tie-on from Martha Stewart's K-Mart Holiday line (a couple years ago). I also made a skirt for my daughter (which I can't put my hands on today) that she hated and never wore. Humf. She was 12 at the time, I can't really blame her, it does have that "sweater lady" look about it. Of course, I choose to look at it as more funky, but it could go either way. I made two more for my friend's daughters, and they loved them. Here's a picture of theirs. It's really pretty easy, so worth the effort even though kids grow out of them by the next year. Just make sure they'll actually wear it before beginning. I love skirts. All skirts. Even skirts that trees wear. Last year, at Anthropologie, they sold a beautiful tree skirt that I loved. I even contemplated buying it for a moment, although it was really expensive. Luckily, I didn't, because I would probably would tire of it, as I do most store bought/mass produced things, and then I would feel awful about the money spent. I rarely tire of home-made things, they seem to age better. Maybe the uniqueness of a handcrafted item makes it somewhat timeless in appeal, I don't know. So I studied the Anthropologie skirt and realized that what I loved most was the pom-pom fringe and hand sewn details (maybe some rhinestones? I can't remember now). I adore pom-pom fringe, always have, and hopefully always will. I came home and set about making my own tree skirt that I could add to over the years. A simple handcrafted item that would hopefully grow more special with time, but if not, I could always move on, it cost me nothing but time and previously collected items. It's made from the simplest materials. I should have ironed it for the photos, but it really doesn't need it for under the tree, so wrinkled it is. The creamy white fabric is really the batting for inside quilts, softer than felt and having a real vintage look. It also needs no finishing on the edges, which is a plus for me. I didn't even use any sort of real measurement, just cut out a general circle shape, then folded it in half and cut again to even up the sides. It's just going around the tree after all, no need for measuring in my mind (which I hate) since I can shape it as needed once on the ground. I free hand cut a little scallop edge and attached it with ruffled seam binding, and added some vintage pom-pom fringe. The fact that a few pom-poms were missing is ok, I'm sure I would have vacuumed a few off eventually. I cut out a few flower and leaf pieces out of felt and hand stitched them on with a few vintage rhinestone buttons. This year I might try to add a few more poinsettias or holly pieces, I ran out of time last year. The last detail I added was some vintage velvet bows made from a pile of scraps I bought at the flea market. I'm not sure why I chose to use creamy pinks and yellows and brown and mossy green, I tend to go with what strikes me when searching through collected items. Guess it was just the mood I was in. Glad I still am... I think it just sort of blends in with the tree, but if I feel different colors pulling me in the future, I suppose I could just add them in the form of ribbon or trim or felt pieces. There you have it, our tree skirt. I'd love to see more if you want to leave a link in the comments...anyone have a flickr group out there for tree skirts? Like I said, I love skirts, mix them with holiday decoration and I'm in heaven! As you can see, I didn't really do too much to it. 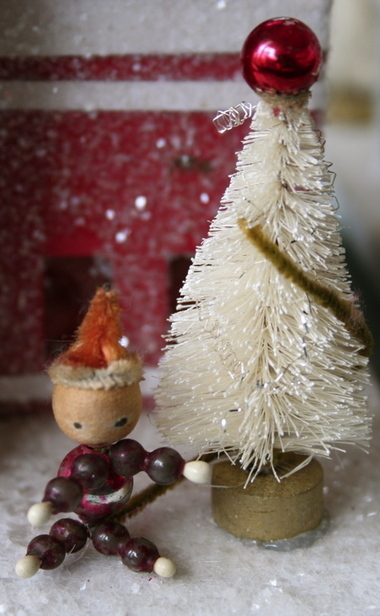 I just glued on some do-dads like paper trim and wrapped the trees with a tiny ornament with a chinelle stem and snowman (flea market finds). I never would have added to a store bought ornament before, it took my friend Amy Hanna's doing it to turn that light bulb on for me. (Thanks Amy!) Somehow, it seemed to me that if I didn't love it the way it was bought, I should either not buy it, or live with it as is, as if adding to a manufactured product was not allowed. Now I think it's just fine to change up a new product, and I'm left with something more personalized that, of course, is more pleasing to me. I mention it here in case some of you are like the old me, thinking about crafting as either all or nothing, make it from scratch or leave it be. Now I see it as a fun creative quickie, and a good way to get my creativity kick-started when I'm a bit stuck. ...and this, this is beautiful. ...but I just can't seem to get with it. This is actually a photo of my front door last year. I found the bottle brush wreath at a flea market, put it inside a Wendy Addison glittered star wreath, and added a few ornaments and my two turtle doves swag to greet all that came by. I believe this year I'm going to tuck my swag in the top of the tree, but who knows. We haven't even bought our tree yet, and the fall bin is still sitting on the floor of the garage, waiting for me to go through it and pack it away. As for your two turtle dove swags, if you ordered one it should arrive today (if it didn't yesterday). They were all sent out Priority Mail on Monday. Does your Post Office allow you to bring in a bunch of boxes to mail at the counter? Mine doesn't. Let's just say I am very well versed at the use of the self-help mailing machines! Anyway, thanks again for the orders, hope you have a fun time putting yours together. Don't hesitate to add to it or personalize it too! Speaking of kits, Ulla has a couple really cute ones for sale like this one. The two turtle doves kit introduced me to the adorable Jenny, and she in turn told me that the fab Jennifer Paganelli of Sis Boom fame has started a blog as well. Finding new blogs is always a little creative kit in itself, stirring up new ideas waiting to be played out in one's own style. Hopefully, my mind will catch up to the fact that it's the holidays before they're over. Until then, I'll leave you with a couple more shots from last year.